Images (Top) Aquamanile : Licorne Alliage cuivreux, vers 1400 Cl. 2136 © RMN-Grand Palais (musée de Cluny - musée national du Moyen-Âge) / G. Blot. 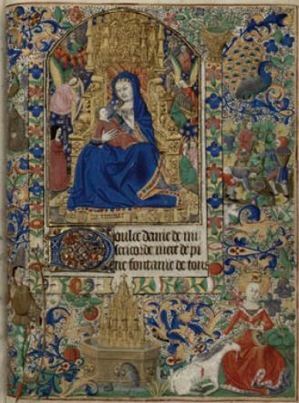 (Middle) Livre d’heures dit de Yolande d’Aragon: «la Vierge Marie et la chasse à la licorne» Enluminure sur parchemin, vers 1460 - 1470 Ms 22 (Rés. ms 2) © Bibliothèque Méjanes, Aix-en-Provence. (Bottom) Graduel de Sainte-Rictrude de Marchiennes: «David menacé par le lion et la licorne» Parchemin, 1548 ms 112, fol. 88 Bibliothèque municipale de Douai, © IRHT-CNRS. Reproduced with permission from the Musee Cluny. Everywhere you look there seems to be some product inspired by a unicorn: purple frappuccinos, table lamps, there's even a shop (in Brooklyn, naturally,) that specializes in unicorn horns proudly crafted in the USA. Privately held companies valued at over a billion dollars are known as "unicorns" to represent the statistical rarity of such entities. (Airbnb and SpaceX are two examples.) Yet, despite what seems to be rampant unicorn fever, it's nothing new; the ancient Indus carved unicorns onto seals, and the beasts appear in the Physiologus, an ancient Greek bestiary, which ascribes curative powers to unicorn horns. By the Middle Ages, unicorns came to symbolize the life and trials of Jesus Christ. 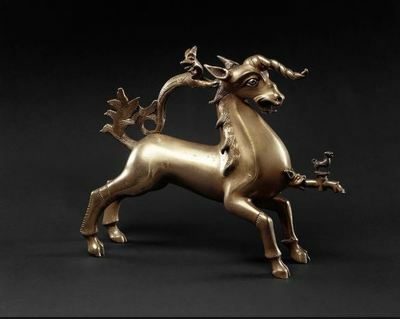 Now, Magical Unicorns, the latest exhibition on view at the Musée Cluny in Paris offers a comprehensive look at how unicorns have been depicted over the past 500 years. Engravings, sculptures, illuminated manuscripts, and other items illustrate the allegorical significance of these mythical beasts and humankind's enduring fascination with them. The highlight of the show is a set of six tapestries entitled The Lady and the Unicorn, part of the Cluny's permanent collection. Woven around 1500, the tapestries are believed to have been designed by Jean Bourdichon, offical court painter to four French Kings and the illuminator responsible for the sumptuous Book of Hours created for Queen Anne of Brittany. Showcased in a dimly-lit rotunda to preserve the fabrics, the scarlet 12-feet by 9-feet silk and wool tapestries are complex visual meditations on the meaning of life, filled with allegorical iconography. To quote Sebastian from Shakespeare's The Tempest: "Now I will believe that there are unicorns." Images (Top) Aquamanile : Licorne Alliage cuivreux, vers 1400 Cl. 2136 © RMN-Grand Palais (musée de Cluny - musée national du Moyen-Âge) / G. Blot. 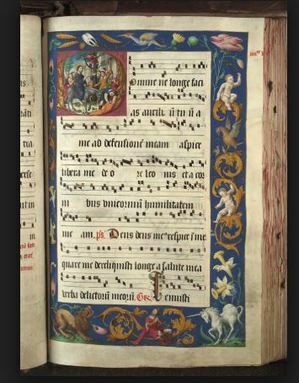 (Middle) Livre d'heures dit de Yolande d'Aragon: «la Vierge Marie et la chasse à la licorne» Enluminure sur parchemin, vers 1460 - 1470 Ms 22 (Rés. ms 2) © Bibliothèque Méjanes, Aix-en-Provence. (Bottom) Graduel de Sainte-Rictrude de Marchiennes: «David menacé par le lion et la licorne» Parchemin, 1548 ms 112, fol. 88 Bibliothèque municipale de Douai, © IRHT-CNRS. Reproduced with permission from the Musee Cluny.